AS OF TUESDAY , DEC 4, A BILL HAS BEEN PASSED BY THE US HOUSE AND SENATE THAT DECLARES THAT OUR MILITARY WORKING DOGS OF ALL BREEDS WILL NO LONGER BE CLASSIFIED AS “MILITARY EQUIPMENT” TO BE LEFT BEHIND IN FOREIGN LANDS…BUT AS MILITARY VETERANS. THESE DOGS NOW WILL BE RETURNING TO LACKLAND AFB , FOR THEIR SERVICES AS US HEROES. THEY WILL BE EVALUATED, AND RETRAINED AND REHOMED IF NEEDED. WE NOW AWAIT PRESIDENT OBAMA’S SIGNATURE TO MAKE THIS LAW. WE AS DOG LOVERS ARE ETERNALLY GRATEFUL TO THE CONGRESS FOR DOING WHAT HAS BEEN LONG..OVERDUE. My first reaction was “Wait, seriously? This needed to be fixed?” So, I wanted to know more and found this CNN Article, When a dog isn’t a dog. The article was from January and talked about the bills being considered. From the above, I figured they were passed on Dec 4. “What bills,” I wondered. I stumbled across an ASPCA “Call to Action” page which claimed that the House version already passed, and all that was needed was the Senate version. “Woo,” I thought, “this should be an easy push”. Fill out the form, maybe bug the Senate Armed Services committee chair. Find a good way to share that with friends to get them to push too. I shared the ASPCA Action Page, chatted with some friends to explain what the problem was, and why it could be pretty easily fixed. I even created a shareable image with links, to make it easy for the message to spread. I went to the FB page that my friend shared the above image from and posted my “call to action” image with explanation on their wall. Just yesterday, however, someone posted on their wall that the image was wrong, the source they used was wrong, and that the bills did not pass. I quickly deleted my images, not wanting to spread misinformation. Eventually, I found my way to the two standalone bills, HR4103: Canine Members of the Armed Forces Act and S2134 of the same name. This [intentionally unnamed] Facebook user was right, they were both dead, sitting in a committee. However, I started to find a trail suggesting that the House version had not been passed as a stand-alone bill, but had been rolled into an unnamed “omnibus military bill”. I kept searching, having to wade through many vague pages ranging from “omg, save the dogs! Pass bills we won’t name!” to “We did it! It passed!”, but with no particulars. Turned out, the “omnibus military bill” was HR 4310: National Defense Authorization Act for Fiscal Year 2013. The HR4103 text had been merged into HR4310 as Section 361. I updated the Unnamed FB user with the results of this, then updated my shareable call to action, as it still matched the ASPCA Action page. Cool stuff. At this point, I was ready to go share the call to action on a Facebook page that would make sense, Military Working Dog Adoptions. This time, I checked the wall a bit first to see, since Dec 4th, if anyone had conflicting reports. Sure enough, December 8th onwards, a few folks rejoicing the Senate passing the “Canine Members of the Armed Forces Act” (S2134). After the House bill burn, I knew I had to look deeper before I was adding to the confusion. Googling ‘S2134 passed” turned up nothing. The Library of Congress page showed it still in Committee. I came across yet another ASPCA page, this time a December 5th blog post, the day after the alleged bill passing in the first text: The Senate Foes to the Dogs: Two Important Bills Passed. First, the Senate took up the cause of canine heroes who have served in our military and passed a provision that streamlines the adoption process for retired military dogs and authorizes the Department of Defense to provide veterinary care in the animals’ retirement without any cost to American taxpayers. Military dogs perform dangerous, critical tasks, and it is our duty to honor these dogs and ensure they are cared for after their service is complete. The House passed similar language in their version of the military bill earlier this year. A provision? Oho. A quick Google of “senate dogs military provision” in the past month should help! No. Not at all. I ended up just looking up the Senate NDAA S3254. Unlike the House version, a quick Ctrl-F turned up nothing in the Summary. Not trusting that, I pulled up the full text, and there it was in sections 1049 and 993. S2134 had been rolled into S3254. Both NDAA versions are certain to pass in some form, and the provisions are unlikely to meet resistance due to their minimal cost. Declaring victory was right and I’m very glad that Congress will give the military and non-profits more ways to work together to treat working and retired canines better. The lessons in all this madness? If you’re going to promote a cause, make sure you’re willing to spend some time making sure it’s right. If you’re promoting the cause, help people out and provide details wherever possible. Misinformation often spreads faster than facts. Congress is deeply confusing to even an informed voter. On Govtrack, for example (as well as on THOMAS), there is no way to see when a Bill has been amended to another bill. H4103 and S2134 will look forever like “unfinished business”. Think long and hard about hitting Share. Are you adding signal to fact or fiction? Featured Posts, Soapbox, Technology ASPCA, Congress, Facebook, Govtrack, Military, social networking. permalink. There should be no reason we are delaying on this bill. Our service dogs should never be left behind after the protection they have provided our men and women. 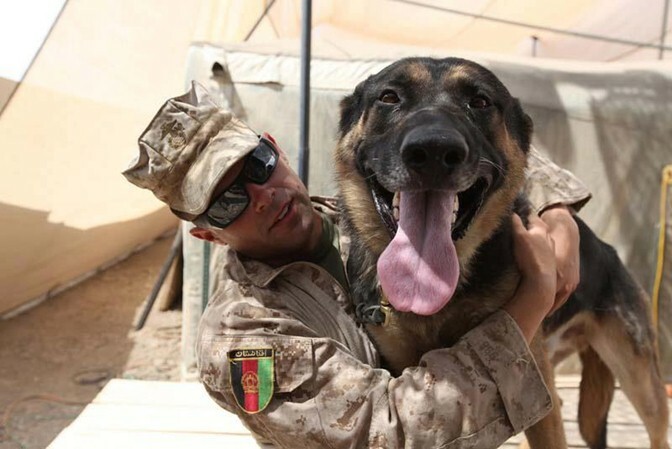 Directs the Secretary to classify military working dogs as canine members of the Armed Forces. Prohibits their classification as equipment. Authorizes the Secretary concerned, after determining that a military working dog should be retired and that no suitable adoption is available, to transfer the dog to the 341st Training Squadron or to another location for adoption. Authorizes the use of frequent traveler miles to facilitate such adoptions. Very good article and excellent summary. If only everyone was familiar with points 1, 2, and 5, the Web would be a much more informative (and much less annoying) place! I saw that same FB post with that same pic–almost hit “Share” and decided to research first. Your research came up in my Google Search first. Nice work. Thanks for sharing it. Thanks for Jeremy’s research. When I was following up on the original facebook post I stumbled on his comments and eventually this blog which was great. The text that reclassified Military Working Dogs from “equipment” to “canine members of the Armed Forces” was deleted in the final approved version of H.R.4310. The easing of adoption and veterinary care provisions remain. At this point my sources tell me that it was at Senator John McCain’s insistence that the text was removed. I have been talking with the Senator’s office to see if I can get a reason WHY?? If you would like to follow the Canine Members of the Armed Forces Act, please go to the Facebook page of the woman who got Congressman Jones and Senator Blumenthal to bring out the bill. I’m so glad you are bringing this incorrect information about the reclassification to light. We’ve not been able to locate the person/group who started sharing this miss-information. The current status of the reclassification is that 6 Senators wrote to Sec Panetta asking him to make the change in the regs. The Air Force is drafting a response. Please learn the accurate history of the bill and follow it at http://www.facebook.com/MilitaryWorkingDogReclassification. Just so you know, Congressman Jones and Senator Blumenthal brought the bill out at the request of my daughter. MWD thanks for your continued support on behalf of Retired MWD Gizmo A085, deceased; Retired MWD Bianca W229, deceased; Retired MWD Marco B127, deceased; Retired MWD Brix D141; and Retired MWD Rambo N577.